Chennai, April 21 (IANS) Composer G.V. Prakash Kumar, nephew of Oscar-winning musician A.R. Rahman, will marry his childhood sweetheart Saindhavi, a popular playback singer, here on June 27. "G.V. 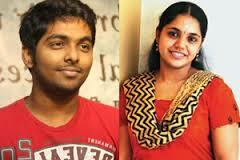 Prakash will marry Saindhavi on June 27 at 9 a.m. followed by reception at 6 p.m. on the same day. Parents of the couple are busy making arrangements for the wedding," said a statement. Chennai-based designer Anu Vardhan, wife of Tamil director Vishnuvardhan, is likely to design the wedding dress for the bride and groom. The wedding will take place at Mayor Ramamathan Chettiar centre, one of the prominent locations for all celebrity weddings in the town. The couple has known each other since childhood. They have worked together in Tamil films such as "Deiva Thirumagal", "Thaandavam" and "Udhayam NH4". Prakash, who debuted as a composer at the age of 17 with Tamil drama "Veyil", has composed music for blockbusters "Pollathavan", "Aadukalam", "Mayakkam Enna" among others. He has also composed music for Hindi films such as "Gangs of Wasseypur" and "Joker".